Good morning everyone!!! I never get up this early, but I just couldn't stay asleep. Right now, I'm watching America's Next Top Model reruns on MTV. I usually hate this show but somehow, I can't look away... except at the monitor!!! But on the brighter side of things (since it is morning), this is a picture of our cat. Everyone in the Blogosphere has cat pictures and I was starting to feel left out. Her name is Butter, and she's completely huge. My mom only feeds her Party Mix Treats, so that's what the cat lives off of. She's usually pretty friendly to people, but she likes to attack the dog. Our dog is ancient and last night, the cat jumped on her back. The dog completely flipped out, snapped at her, and started barking. I didn't break them up because the only thing I could do was laugh hysterically. But here's the deal with food. I baked a lot yesterday, so you probably know what that means already... MUFFINS!! I baked Carrot Pineapple Muffins from The Everyday Vegan. The recipe calls for canned crushed pineapple, but I just cut up chunks of fresh pineapple. These were really moist and flavorful... and tall (as they usually are). I ate two of these babies for dinner. I just loved them. Directions: Preheat oven to 375F. In a large bowl, combine dry ingredients. Mix well. Add the carrots, pineapple, and raisins and stir well. In a separate bowl, combine maple syrup, milk, and vanilla, and add to dry mixture. Stir through and add canola oil as it starts to come together. Mix until just combined. Spoon into a lightly greased muffin tin and bake for 19-23 minutes or until a toothpick comes out clean. Makes 10-12 muffins. 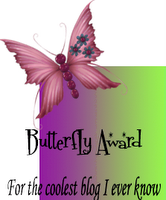 As for more fun and exciting stuff, I got a Butterfly Award from Bethany at Spotted Devil Cat and his Vegan Assistant (that name is just amazing). 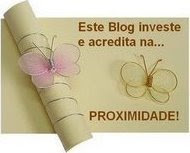 It's my first blog award, I really appreciate it, Bethany!!! In fact, this post is dedicated to Bethany because she's awesome and hands up one of the FUNNIEST people I've ever met. (4) choose 10 blogs that you think are really cool, link to them, contact each person and talk about why you think their blogs are cool. Since some of my favorite blogs already have the award, these blogs are ones that I don't think have it yet. I always stalk these blogs religiously, so they deserve it!!! They keep me away from my homework for hours. 1. Agnes' World of Vegan Pleasures- Agness!!! You are the happiest person I know. I love talking to you all the time about life, food, school, guys, and all that other fun girl stuff. I know we'll meet someday even if you live in Poland. Stay happy and funky!!! 2. A Vegan with a Reason- Becca!!! We have so much in common and you are a blast to talk to. You have awesome taste in music, and I know we'd be great friends if you lived in the Pittsburgh. We both have a weird sense of humor, but that's why you're so funny. 3. Sugar Plum- Emiline!!! You are such a creative, and cool cook. I love reading your blog because I know I'll see something crazy and beautiful. You're really friendly, and I know you'll reach your dreams of going to culinary school. 5. A Year of Crockpotting- Stephanie!! I read your blog everyday in amazement at how creative and hilarious you are. You are really honest, but in a funny way. The food you come up with is great, and I know you'll be using the crockpot forever!!! 6. Cookie Madness- Anna!! Where do I even begin? You are a master baker-cookie maker. You're soo nice and friendly and Fuzz is lucky to have you as a mom. 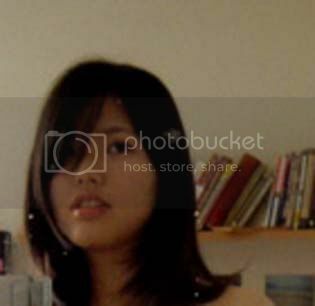 You were the first blog I started reading, and you inspired me to start my own. Thanks for being so great! 7. Yummy, Low Calorie Diet Food- Juliet!!! You've got a knack for finding really good food. I always add something to my grocery list after I read your blog. You're a really positive person and you know a lot about nutrition, too. Your husband's a lucky man!!! 8. Chocolate Covered Vegan- Katie!!! You are such a nice girl. You're always smiling (in your blog pictures) and just being plain adorable. You are a master fondant handler and I envy your mad skills!! You'll always be the Cupcake Queen! 10. Flowers at Home- Flower! You are a very gentle human being and a beautiful writer. I don't think you would ever say something mean or hurt anyone's feelings. You're just a really good person. Your blog is very soothing and calming... like a warm, bubble bath... with candles. LOL oh my god, your kitty IS huge! And yum, muffins... want!! Congratulations on the award! Butter is such a cutie!! You are the sweetest thing. I feel like I just won an oscar, or a veg award. Congrats on your butterfly, you really deserve it for awesomeness. I have to do work tonight, so I'll ponder and consider my awards carefully, secure them with an audit firm, and send them out tomorrow. Thanks for a fun post, and the gigantor muffins look fab as always. your kitty is too cute! Oh my gosh, girl, you seriously just made my Saturday! And especially coming from such a sweet blogger, the fact that you gave the award to me means so much! You really are a sweetheart, and I'm so glad you started blogging so I got the chance to "meet" you! Oh and I was watching ANTM too! Anything in a marathon has me hooked! Beautiful writer, nobody has said that about me ever!!! Aww my first award thats so cool its going to be hard only picking 10 people to pass it on to. Your cat is cute even though she big, I feel really sorry for your dog though!! your kitty is as cutie! hahaha and i was watching reruns of next top model on mtv this morning too! Congrats on your award! And those muffins are TALL - how funny! The lesson went well! only five of teh six showed up, but the secretary called the kid's mother and I think he will be ocming next week. Only time will tell, I suppose. To answer your question you asked me, I used 3/4c of milk (whatever kind) and froth it a lot (I love foam!) and then add 3 shots of expresso. Hi Jo. Thanks for stopping by. The soaps are made with soy, so I figure that must be pretty earth friendly. Love Butter, your cat. We had a cat a long time ago by the name of Sam. Sam was so big that when he went out and wanted back in, he would actually knock on the door. Can you believe that? I also love your muffins. There's nothing like a big cup of coffee and a muffin for me especially on cold Fall mornings. Great recipe. I think I would love those muffins. Mmmm, pineapple? carrot? Oh yea, I'm there. Nice work! Thank you for the award! I feel all warm and fuzzy inside. I like the muffins. They look tall. What does your cat eat? Party Mix Treats? What are those? Love your cat's name! Congrats on the award and your muffins look great! Awww. You *totally* deserve the award!! And thank you for passing it along to me. I'm honored! I'll get this posted up in the next week or two. I hope all is well! I love butter. ok, not the kind you eat, but your awesome cat. I only have 1 big kitty now, Faline. I love hugging her. You totally deserve the award. You're too funny and your blog makes me smile.